News - Types of Lifting Magnets - Armstrong Magnetics, Inc. When you are planning to purchase a lifting magnet for handling your steel loads, you probably go to Google, YouTube, Yahoo or an industrial B2B web platform to do some researches. You may find yourself bombarded with the choices of lifting magnets as you review their specifications and evaluate which type is best suitable for your particular lifting job. Eventhough there are so many different appearances, brands and lifting capacities of lifting magnets, they can be divided into two main categories according to the kinds of their magnetic field sources: permanent lifting magnets and electro lifting magnets. Permanent magnet materials which are the magnetic field sources: The magnet materials could be Neodymium, Ceramic, Alnico etc. Steel structure part of high permeability iron materials with little resistance against the flux: It guides the magnetic flux from the permanent magnets to ferromagnetic load. Switch of the magnetic flux: It is to release the flux from pole(s) of the lifting magnet to go through the load underneath and back into the other pole(s). This switch could be manually operated handle, electrical current pulse, or pneumatic pressure. Electro permanent lifting magnet should be permanent lifting magnet in essence because its magnetic flux comes from the permanent magnets instead of electric current. The current pulses are to switch on or off its magnetic power only and there is no electricity during the period of holding the load. Permanent lifting magnets are most widely used because they are easy to operate, durable, portable, and cost effective. The magnetic field released from the poles of permanent lifting magnet is shallow, so that the attractive force to the load would decrease dramatically with increases in air gap between the poles of the permanent lifting magnet and the load. Therefore, they are used for flat plates and regular round cylinders, but not good for scraps or the load with uneven surfaces. 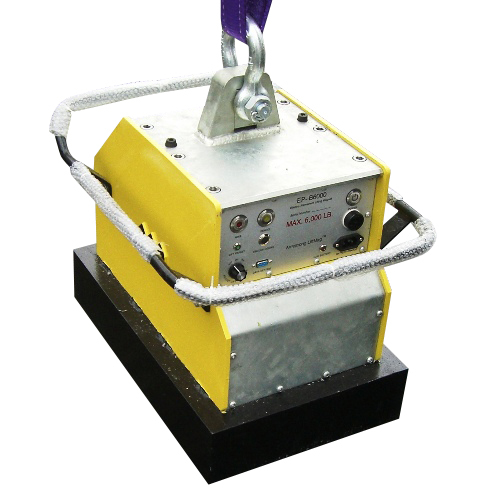 For permanent lifting magnets with a manually operated handle, the lifting capacity is limited. While rotating the handle from OFF to ON position, the rotator inside the lifting magnet encounters a significant resistance against the rotation until it reaches the ON position. When the air gap between the magnet and the load is too big or the plate underneath is too thin, the resistance would become so extreme that you are unable to even turn the handle from ON to OFF. 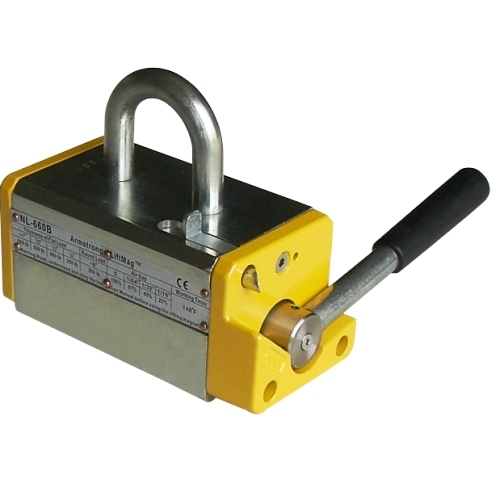 Also, the bigger the lifting capacity of the permanent lifting magnets, the harder the rotating of the handle. For permanent lifting magnets with rated capacity more than 4,400 lb, it would be hard or impossible to rotate the handle from ON to OFF for thin plates or cylinders. Coil(s) which is the magnetic field source while a direct current flows through it. Steel structure part of high permeability steel materials which guides the magnetic flux to circulate between the electro lifting magnet and the load. Electrical switch which is for turning on and off the electrical current in order to release the magnetic flux to the load resulting in holding the load, or cut off the magnetic flux so that the holding force disappeared. The electric source could be mains supply or batteries. For mains supply, there should be a rectifier which have the alterative current rectified to direct current to supply the coil of the electro lifting magnet. You might need a backup system which is a set of quite a few batteries. The backup system can replace the mains supply as an alternative power source in case of mains power failure so that the electro lifting magnets still have lifting power to the load. Without the backup system the load would drop in the case and a serious accident could occur. For battery supply, normally auto type batteries are installed in the electro lifting magnets. A battery charger is needed for it. The biggest difference of the magnetic fields between electro lifting magnets and permanent lifting magnets is the distance the magnet field can go away from the magnetic poles. The magnetic flux from electro lifting magnets can go far compared with permanent lifting magnets. So that electro lifting magnets are suitable to lift scraps or the loads with uneven surfaces. It is an indispensable advantage if your loads are those mentioned. Theoretically speaking, the lifting capacity of an electro lifting magnet is unlimited. Some manufacturers have produced large electro lifting magnets with lifting capacity of up to 20 tons. For the electro lifting magnets powered by mains supply, a backup system is a big investment. If your loads to be lifted are thick and flat, less than 4,400 lbs, use permanent lifting magnets. If your loads are scraps, or the loads with Irregular surfaces, use electro lifting magnets. Sometimes it is not easy to decide which type of lifting magnets would be better for your use. If you are not confident for that, please fill the form of “Customer's Application Data for Lifting Magnet” at http://www.armsmag.com/form-lifting-application-data.html and submit it. We would like to discuss with you then about it.